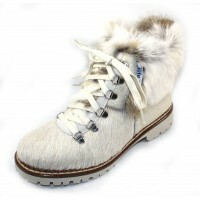 Waterproof inside zippered boot with wool fur collar and linings. Retractable ice gripper built into rubber sole. Removable insole. 2 inch wedge heel. Imported.